These divrei Torah were adapted from the hashkafa portion of Rabbi Yissochar Frand’s Commuter Chavrusah Torah Tapes on the weekly Torah portion: Tape # 88, Parshas Zachor. Good Shabbos! The Ibn Ezra makes two very interesting comments on this pasuk. He says regarding the phrase “he found favor with the multitude (literally the majority) of his brothers,” that because of jealousy, a person cannot find favor with everyone. It is impossible to be perfectly popular. Then the Ibn Ezra comments on the buildup of praises that we have in the pasuk. The concluding, and seemingly greatest praise is that “he spoke with peace to all his posterity.” The Ibn Ezra comments that this means he was on good terms with all his children and grandchildren. This seems anti-climactic. Is this the greatest thing we can find to say about Mordechai HaYehudi? The Ibn Ezra says this is indeed a great praise. Think of all the children and grandchildren that Mordechai had. Did each one turn out exactly like Mordechai would have wanted? If Mordechai would have wanted all his children and grandchildren to become Torah scholars, do we expect that is the way it would have worked out? Or, if he wanted them all to be expert businesspersons, do we expect that is the way it would turn out? Maybe there would be a black sheep in the family that became a scholar! And yet, he spoke in peace to all descendants. He was able to maintain a peaceful relationship with all his children and all his grandchildren. This, the Ibn Ezra tells us, is a great thing. Because of the natural fear that children have towards parents, it is not always true that there is a loving relationship between parents and children. Therefore if Mordechai could maintain such a relationship, this is indeed the highest accolade that the Torah can offer him. I think this is a great ethical lesson for us. We try to raise children, and we have certain ideals and standards of how we would like our children to be. It does not always turn out like that. But we should always strive to maintain a relationship where we can, at least, speak peacefully with all our offspring. It would seem to us that if we would speculate when there is a greater mitzvah to gladden the hearts of the widows and orphans — on Yom Tov or on Purim — we would logically think that on Yom Tov there would be a bigger mitzvah. Yom Tov, after all, is a Biblical command. Purim is Rabbinic in origin. Yet the Ramba”m goes out of his way and says something that he says very rarely in the entire Mishneh Torah — “that one who gladdens the hearts of these can be compared to the Shechina!” He does not say that concerning the laws of Yom Tov. What is the Ramba”m telling us here by saying that a person who makes the less fortunate happy on Purim is comparable to G-d? The Medrash continues that Mordechai responded and said that the reason the Jews were suffering was a result of the grandson of ‘Karahu.’ Who is ‘Karahu?’ ‘Karahu’ refers to Amalek about which it is stated, “Who happened to you (asher Korecha) on the road” [Devorim 25:18]. Our Sages tell us that Amalek represents the antithesis of Belief in this world. Amalek denies the existence of a Creator of the world. When Mordechai told Esther that the Jews are suffering because of ‘Karahu,’ he was saying that the Jews were suffering because of a terrible, terrible, lack of Emunah (belief). This is a lack of belief that even in our own times we don’t see. What do I mean? We have Jews today who do not believe — do they ‘believe’ more than the Jews in the time of Mordechai and Esther? What I mean is as follows: The Talmud says that the reason the Jews were deserving of destruction, was that “they enjoyed the banquet of that evil one” [Megilla 12a]. What was so bad about partaking in the banquet of Ahashuerus? Was it Treife? Heaven Forbid! “The drinking was according to the law, nothing was forced” [Esther 1:8]. It was Kosher as could be, according to every stringent opinion. So what was the sin? The sin was that the Jews attended a Feast given by the gentile, at which the gentiles took out the Vessels of Service (Klei Shares) of the Beis HaMikdash — and the Jews sat there and kept on feasting! Even Jews who today are totally assimilated, who would not think twice about eating at a non-kosher feast… if their non-Jewish hosts would serve them on the utensils stolen from the holy Temple, their reaction would be: Stop! “These are the utensils of the Holy Temple.” Which Jew would not get up and yell, “These are my utensils! These are the vessels of our Beis HaMikdash!”? The fact that the Jews in Shushan could sit there through a meal and use those vessels was a terrible sin! What was wrong with them? What was wrong with those Jews was that they were ‘hopeless Jews.’ They were Jews who had lost all hope. They had counted the 70 years of the Exile, and knew that the Exile was supposed to be over and yet the Redemption had not yet come. Those were Jews who had seen the building of the Second Beis HaMikdash stopped in its tracks. Those were Jews who had come to the conclusion that there would be no Redemption. Those were Jews who said “Moshiach is not going to come.” Those were hopeless Jews. The difference between those Jews and the Jews of our day is that today, as non-observant as a Jew may be, he can still can believe in Judaism, he can believe in G-d and redemption, and he knows that there is hope. That is what the story of Purim restored. There was a decree. The Jews were motivated to do Teshuva and the Ribbono shel Olam came back and breathed life into this dead body of the Jewish people and gave them hope. That is what happened on Purim. G-d took His breath of Life and restored hope to a forlorn nation. Rav Hutner said there is a mitzvah to emulate G-d. If G-d on Purim brought the dead back to life, if He took hopeless and down-trodden Jews and gave them hope, it becomes our Mitzvah on Purim to do the same thing. Therefore the Ramba”m says that on Purim there is no greater mitzvah than to gladden the hearts of the unfortunate and downtrodden. The essence of the day is to give hope, meaning, and comfort to broken-spirited people… because that is what G-d did. A person therefore who does this will be comparable to G-d.
Treife — literally ‘torn’; an animal in which certain body parts are torn is non-kosher. Yashan –literally ‘old’; refers to grain from the prior year’s crop; ‘new’ grain which first grows after the 16th of Nissan (the date of the Omer offering) is forbidden until that date on the following year. Hidurim –literally ‘beautification’; refers to performance of commands in the most optimal way. Rav Avraham Ibn Ezra –(1089-1164) Composed classic commentary on entire Tanach famous for its grammatical and linguistic analysis. Born in Toledo, Spain. Ramba”m — Rav Moshe ben Maimon (1135-1204); One of Judaism’s leading Torah authorities and philosophers. Codified all of Jewish law in his Mishneh Torah. Rav Yitzchok Hutner — (1907-1980) Rosh Yeshiva of Mesivta Rav Chaim Berlin, New York; Author of Pachad Yitzchok, his collected discourses. Tape # 048 – Is Shaving Permitted on Chol HaMoed? Tape # 091 – Americans in Yerushalayim: Two Day Yom Tov or One? 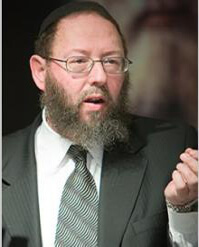 Rabbi Yissocher Frand: In Printand is available through the Project Genesis Bookstore (under Jewish Philosophy) or by calling Project Genesis at (410)654-1799.